It would appear that one of the biggest threats to our digital security has been exploits in Word documents. Or at least, from the extensive security features built into Word 2010, one would come to that conclusion. 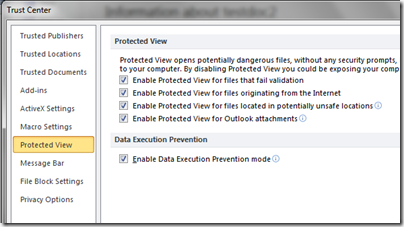 Now going to Protected View Settings brings up a security console that would make Norton squirm. And, remember; this is WORD! This is the Trust Center: a place where you can set all sorts of security settings for your Word documents and how Word 2010 acts when opening a document. 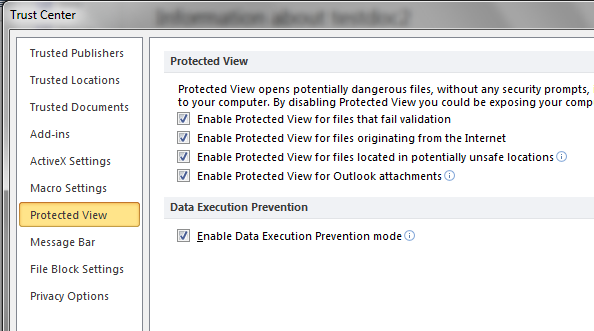 This is the Protected View area which gives us the ability to enable the feature for various scenarios. Unchecking the middle two boxes got rid of the message on my .doc file when opening in Word 2010 locally. However, I tried all sort of combinations and still couldn’t get Word to open the file from my webserver. So unfortunately I have no solution. It is, after all, still in beta. But I’m not sure what I’m more concerned about: not being able to open a doc from an internet location, or knowing I’m going to have to read a manual on security features just to use the next version of Word productively.